When we were first alerted to the existence of poorly shot, poorly edited YouTube videos made by a replica car manufacturer that featured Tanner Foust and clips from Top Gear, it raised a number of red flags. What was Foust (and Steven Spielberg) doing endorsing this company? Can they really make you a Saleen S7 for $20,000? How come they never feature any completed cars on their websites? This was our first foray into the the bizarre world of Panama-based Super Replicas, lately known as "Top Gear Carbon Copies." It's a world full of unsubstantiated claims and falsehoods about celebrity-endorsed exotic cars that cost as much as a Toyota Camry and it's been going on for years. If you believe them, and there are reasons why you probably shouldn’t, then within just three months of placing your order, you can own a Bentley Mulsanne for $26,000, a Ford GT with a supercharged 5.4-liter V8 for $24,000, and a LaFerrari with a V12 for just $38,000. Yes, that LaFerrari. The one that was unveiled this month. How would you like a perfect Bugatti Veyron clone – complete with an 1,100-horspower 16-cylinder engine – for only $49,000? Most people would probably say that it's too good to be true. But would you feel better if it was officially endorsed and guaranteed by Tanner Foust, or famed hot rodder Chip Foose? This is all part of the online strategy of Super Replicas. Their presence grown to include five or six websites, several Facebook accounts, and countless videos on YouTube that purport to show their amazing exotic car copies. Their current main sites have the curious domain names of “topgeartvseries.com” and "topgeartvshow.com." For their part, Super Replicas claims that they are, in fact, a legitimate and trustworthy manufacturer of replica exotic cars. They say they make the cars in Mexico, China and Panama and have an office in New York. One representative personally assured me that they sell 300 cars a year, a claim they also make online. The company also claims they have been making replicas for more than 30 years. But as Super Replicas’ claims of affordable exotic glory have grown online, so has their list of doubters and people ready to call them fraudsters and scammers. Entire websites are devoted to claiming that Super Replicas takes buyers’ money and never delivers any actual cars; numerous YouTube videos and comments exist to ridicule their laughably unprofessional promotional videos and hard-to-believe business plan. We could find no convincing evidence that they manufacture most of the replicas advertised on their website. What’s not in doubt is the fact that Super Replicas has a long history of falsely claiming that American celebrities endorse their products and are actively involved in their business. After being featured in their videos, Chip Foose has said he has nothing to do with Super Replicas. A spokeswoman for BBC World Productions, which produces Top Gear, also strongly denied that Tanner Foust is involved with the company in any form. That’s funny, because Super Replicas says online that Foust is their CEO. If you want to purchase a Super Replicas car – let’s say, a Porsche Panamera, an SRT Viper, or even a Koenigsegg CCX clone – you look at their extensive online catalog and then tell them what you want. They supposedly start building it for you on a “tube chassis” or using a donor car like a Toyota MR2. Depending on your budget, you can have a Toyota V6 engine on the low end or a new BMW V12 from a 760Li on the high end. They like to promote that engine quite a bit in their videos. Bet you didn’t know there are hundreds of BMW V12s just sitting around, waiting to be installed in replica Lamborghinis, did you? Perhaps best of all, they also claim they can install a Tesla Motors battery pack so your replica can have electrified performance as well. A Tesla spokeswoman told me that they manufacture powertrain components for partners like Toyota and Daimler, but not Super Replicas. As the replica car is built, they send you the bill in various stages, which makes it sound like a reasonable and even affordable way to get an exotic car. You pay as they go along. Also, there seems to be no end to what they can make you – Camaros, Escalades, Koenigseggs, Land Rovers, the BMW Concept Vision Efficient Dynamics, even the Tumbler from the Dark Knight Trilogy. You name it, they claim they can make it for you in three months and almost always for less than $50,000. They guarantee that their replicas are a good investment, one that will only skyrocket in value over time instead of depreciating like most cars do. They even offer franchising opportunities. So a buyer sees pictures of the car he or she wants, but never sees the pictures of what he or she will ultimately get. In 2008, Panama-based blogger Don Ray Williams received a request from a man in Texas. The Texan wanted him to look into Super Replicas' promises of near-exact copies of Ferraris, Lamborghinis and other high-end supercars for as low as $20,000. Williams agreed to check them out. “I thought it could be a good post for the blog,” said Williams, an American reitree whose blog Chiriquí Chatter is devoted to life in the small town of David, Panama, population 83,000. When he reached out to Super Replicas, he came into contact with a man who called himself Tony Sinclair. Sinclair initially didn’t want to show Williams the Super Replicas factory, saying it was for “serious buyers only.” But Sinclair changed his tune when Williams told him he would report in his blog that Super Replicas refused to show him the goods. Williams went on three tours of Super Replicas’ shops in David. He was shown bits and pieces of far-from-complete Bugatti, Lamborghini and Ferrari replicas. He saw tube frames and an MR2 that was being taken apart for conversion. He never saw the completed cars he was promised. And when he found what appeared to be a completed car in front of a restaurant, Sinclair told him “they were not representative of their normal high quality” and asked him not to take photos. He wrote that he became reluctant to post more about them without seeing a completed car. That was in 2010. These days, Williams says he has no opinion one way or another on Super Replicas. Contacted for this story, he told me he still gets traffic from searches related to the company. And he said his posts garnered a great deal of comments from prospective buyers and skeptics. In 2011, Williams received an email from a man in Brazil who said he “sent money to this people (sic) and they simply disappeared.” That’s not uncommon, Williams told me. Over the past few years, “a large number of people” from Japan, Brazil, the United Arab Emirates and other countries have contacted him to say that they sent Super Replicas anywhere from $20,000 to $40,000 and never received a car. Many of the comments on Williams’ blog posts accuse Sinclair and Super Replicas of being thieves. I emailed and called several people I found online who claimed to have been scammed by Super Replicas, but none responded back. Who exactly are the people behind Super Replicas? That’s quite hard to say. Their videos feature various people, but names are almost never used. One of the most prominent is a tall, bald, muscular Hispanic man referred to as Rither Sanchez. 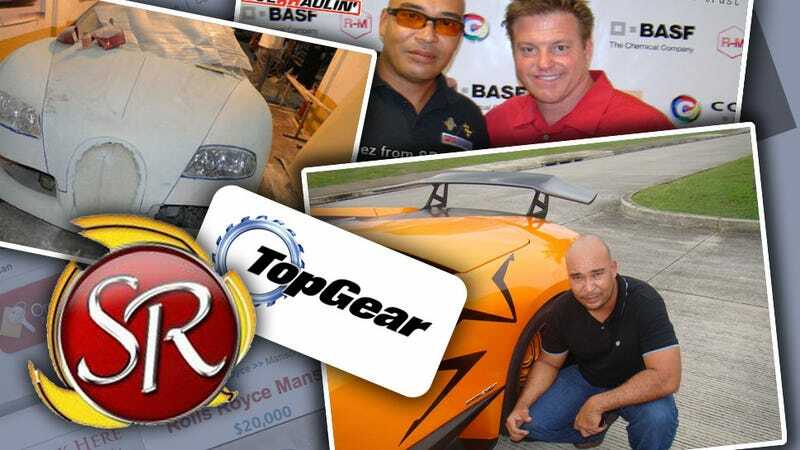 Sanchez is called the “CEO of Super Replicas” in some videos, and he's the one who was filmed getting an autograph from Chip Foose when the hot rod builder came to Panama – a video later used to claim that Foose and Super Replicas were business partners. Other videos feature an American named “Dave” and a Brit named “Mike,” but their full names are never used. The more recent “Top Gear” videos feature an older man with an American accent who stands in front of their building in Panama. And then there is Tony Sinclair, who has often taken to the comments sections of various blogs to defend his products, sometimes with ranting, raving remarks that delve into Mormon theology. To get their side of the story, I called the office of “Top Gear” in New York City. According to their website, they are headquartered at the Carnegie Hall Tower at 152 W 57th Street. I spoke with an Australian who identified himself as Ken Scott. Scott insisted that they’re legitimate – he said they’re finishing up a Maybach Exelero replica that will be done in two weeks. They make about 300 cars a year, he said. He promised me that “Top Gear” and Super Replicas are in fact separate companies, with the former being a seller of replicas made in Panama, Mexico and China, and the latter being a kind of “public relations company” that promotes the cars. I find that odd, considering how the two names are used interchangeably on the various YouTube videos, and because Super Replicas' site links to "Top Gear's." Scott said their cars start around $20,000 to turn a Toyota MR2 into an Aventador replica, complete with a Toyota V6 engine and a three-year Toyota-backed warranty. “If you tell us you want a BMW 760Li twin turbo V12, we can do that for $38,000,” he said. He insisted that there are literally hundreds of possible cars a Super Replicas buyer can choose from, and they feature BMW V12, LS7, Mercedes-Benz and Audi R8 engines. For the Veyron, they can make an actual W16 engine with four turbos using reassembled Bentley W12 engines. When I asked him about how they can supposedly make these replicas so cheaply, he said it’s because the cars are built in Mexico and Panama, where they pay laborers $6 a day. He claims the also get the parts direct from the manufacturers. Still unconvinced, we sent a reporter to stop by their offices on Monday morning to check things out. There is no Top Gear at that address. We found nothing. A security guard said people have come looking for the company but there is no one there who fits the description of the company. I’m not surprised by that since I could find no business registration for either of those names with the New York Secretary of State's office. If that’s out there somewhere, I’d love to see it. But the Super Replicas websites aren’t even the most ridiculous part of this story. Not by a longshot. For that, you have to go to the claims they make in their scores of poorly shot, laughably edited online videos. If you want to copy the Super Replicas way of doing things, here is what to do in three steps. First, you take images and footage from TV shows like Top Gear or even film yourselves with famous people. Second, you twist things around in the editing process to make it seem like those people are endorsing you, or even making cars for you. Third, you attempt to use these videos to sell cars. One of the best examples is their video on their supposed Bugatti Veyron replica. They film what appears to be an actual Bugatti (where they got it is anyone’s guess), advertise it as a replica that costs $49,000, say that “Tanner Foust guarantees you will feel the performance and handling equal to the original Bugatti Veyron." Many of them include actual clips from Top Gear, both the British and American versions. They like to have their employees stand next to or sit in what seem to be actual Ferraris and Lamborghinis which are then passed off as replicas in their videos. The reason these cars look so good is because they are likely the real deal. About the only actual, finished car they ever showcase is a silver Lamborghini Reventon roadster replica. It’s not a bad piece of metalwork, but as far as replicas go it’s a terrible one, clearly not built to scale and never shown hitting the speeds that Super Replicas promises. Notice they never show the inside of it. You can see more photos of it on one of their Flickr pages. Don’t expect them to show any of the Bugattis and Batmobiles they promise. Their Flickr shows pictures of Ferrari Enzo and F430 replicas being built, but not the finished product. The rest appear to be real, actual supercars, not replicas. Then there’s the video where they take an interview with Steven Spielberg and cut in midway with another voice to make it sound like the Jurassic Park director is incredibly impressed with their selection. Yes, Steven Spielberg. Arguably the most successful director in modern cinema, and he’s a huge fan of $20,000 Ferrari knockoffs made in Panama. Another good one is the video where they claim rapper "50 Cents" (sic) came to Panama to visit Super Replicas, and that they sell their cars to "famous musicians and athletes." That video closes with a truly terrible rap video of their own featuring a cameo from Rither Sanchez. Of course, Super Replicas had nothing to do with that event. It was actually the X-Treme Wheels and Drift competition with several Formula D drivers held at the Figali Convention Center in Panama City in March 2009. SpeedHunters attended the event, and you can see photos of it on their site. There's a shocking lack of involvement from Super Replicas or their cars when you do a little research into that event. In particular, their videos seem to prey specifically on non-Americans or non-native English speakers, people who may not be as quick to pick up on the questionable aspects of what they’re doing. That would certainly be consistent with the global nature of the complaints that Don Ray Williams received after he blogged about them. If you haven’t figured it out by now, Top Gear — the real Top Gear — is not an affiliate of Super Replicas, nor did they allow the company to use their name and logo. Tanner Foust is not CEO of “Top Gear Carbon Copies Group” as they claim on their website. He is not involved with the business in any way, despite what representative Ken Scott told me on the phone. Super Replicas’ videos often reference his racing career so perhaps they picked him for some kind of extra boost in credibility. But the shift towards Foust is a move away from an old target: hot rod designer and Overhaulin’ star Chip Foose. About two years ago, Super Replicas began posting videos that heavily imply they had entered into a business agreement with Foose, and many of their other videos purport to feature Foose’s brand of paint. They use the theme song from Overhaulin' as well as pictures and video of Foose, and they also guarantee that their replicas are up to Foose’s standards. I emailed Foose’s people for comment for this story but I did not hear back from them. To make matters even stranger, “Top Gear” also posted a video featuring images of Foose’s deceased sister, who suffered from progeria, and encouraged people to donate to the American Cancer Society. At least they’re philanthropic, kind of. "America is just one big lie"
I called Ken Scott back on Monday night to discuss some of the things I had learned about Top Gear and Super Replicas. I had many questions for him, like why do they claim that Tanner Foust was a shareholder and CEO when the BBC said he wasn’t? Why did they use Chip Foose in their videos? Why don’t they have any pictures of their supposedly finished replica cars? Why couldn’t we find their New York office? Who are Tony Sinclair and Rither Sanchez? And why are there so many people claiming online that they are frauds and rip-off artists? “The agent however is falsely representing Chip Foose when he denys (sic) the business meeting did occur in Panama,” he told me in a follow-up email after our phone conversation. Scott also said that the Tesla battery they offer in their cars is a “clone battery” with identical lithium-ion packs like one would get in a Model S, only for far less money. He promised me that the naysayers are just trolls set up by competitors and actual car companies whose business is threatened by Super Replicas. He said we couldn’t find their office because they meet with people “by appointment only,” and happen to be booked solid through May. And he insisted that Tony Sinclair and Rither Sanchez have nothing to do with “Top Gear,” which he said is the New York business he works for. “I can’t tell you you who he is, or what he is,” Scott said. As for the strange videos, Scott said in his email that Super Replicas’ videos are “marketing advertising productions” that are admittedly unprofessional, but succeed in drawing people’s attention, not unlike car commercials seen on TV. I told Scott I had a hard time believing any of this, and that the photos they show online appear to be those of actual supercars, not replicas. The “little fish,” he said, is Super Replicas and Top Gear, which he claims are honest businesses that help working people afford the cars of their dreams. And the people who say Super Replicas took their money? Just trolls, that's all. I told him I’m not convinced, and I asked him to send me photos of the cars in production and what they looked like when they were completed. If Super Replicas is the real deal, then send me something to prove it, I said. He sent me pictures of two Lamborghinis, including an LP 670-4 SV and a green Gallardo Spyder. Rither Sanchez stands next to both of them, and Scott said they’re an example of what a finished Super Replicas product looks like. If they are in fact replicas and not actual Lamborghinis, then they are the finest replicas the world has ever seen. Like nearly every other aspect of their business, I find that very hard to believe. Have you sent money to Super Replicas? Did you receive a car, or were you ripped off? Can you identify the people in these videos? If so, I want to hear from you. Send me an email at patrick@jalopnik.com. Hat tip to McMike for bringing this to our attention! Update: Not surprisingly, Tanner Foust has said that he has nothing to do with Super Replicas.